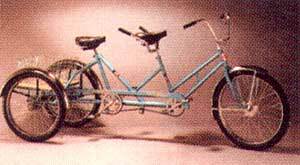 Bicycles built for two! Choose from three models, the two-wheeled Atlantic Coast Tandem and Retro Tandem, or the three-wheeled Tri-Tandem. The Tri-Tandem makes tandem fun available to everyone! With no need to balance, and a wide, stable ride, the Tri-Tandem offers the joy of riding a tandem with the safety and stability of a one-searter tricycle. It's the perfect rental bike, and is great for all couples! Sun model cycles, recumbents, and trikes are sold fully assembled by an authorized dealer for delivery to the customer due to warranty requirements by the manufacturer.